Any Body Can.... be fit! is the philosophy of this program. This program teaches you how! Any Body Can features highlight well-known individuals whose accomplishments have inspired others in the area of fitness. Each feature reminds students that everyone is capable of achieving and maintaining personal fitness. Fitness Check features provide an opportunity for students to get up, get moving, and evaluate their physical fitness levels in all areas of health-related fitness: cardiovascular fitness, body composition, muscular strength, muscular endurance, and flexibility. Active Mind! Active Body! features provide an opportunity that allow students to investigate an important concept for improving their fitness. 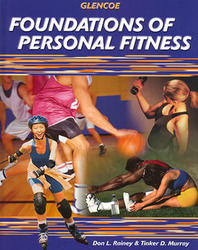 It shows how the combination of an active mind and an active body together lead to complete personal fitness. Consumer Corner features guide students in evaluating consumer issues. It contains information, tips, and cautions regarding the fitness industry.